In October 2016 the Commission for the Conservation of Marine Living Resources (CCAMLR) reached consensus on a New Zealand/United States proposal to establish a large-scale marine protected area in the Ross Sea region of Antarctica. The Agreement will enter into force on 1 December 2017. The Ross Sea region Marine Protected Area covers 1.55 million square kilometres, of which 1.12 million square kilometres, or 72%, is fully protected (no fishing is permitted). It is the world’s largest Marine Protected Area. The agreement balances marine protection, sustainable fishing and science interests. These include important habitats and foraging areas for marine mammals, birds, fish, and invertebrates, including iconic species in the region such as Weddell seals, killer whales and Emperor penguins. New Zealand and the United States first came together to propose the MPA in 2012 and worked together to gain agreement from CCAMLR’s 23 other members. CCAMLR only makes decisions by consensus. This is a significant achievement and represents a major contribution to global marine protection. 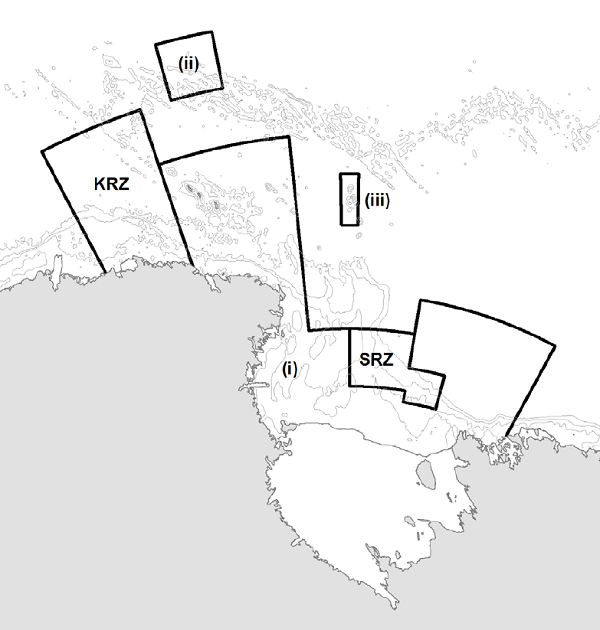 A Krill Research Zone which allows for controlled research fishing for krill, in accordance with the objectives of the MPA – see KRZ below. A lower period of duration was agreed for the management provisions in the Special Research Zone. These restrictions on fishing will expire after 30 years, at which time the Scientific Committee will consider whether other measures are required to meet agreed science and protection objectives. The catch limit for Antarctic toothfish in the Special Research Zone is 15% of the total allowable catch for the Ross Sea fishery. The catch limit meets the scientific research and protection objectives for this area. Should the Special Research Zone expire after 30 years, the catch limit will not exceed 20% of the total allowable catch set for this area. Foreign Affairs Minister Murray McCully announced the breakthrough agreement. fishing info: Fully protected area where no fishing is permitted.